A mega job fair was held by SynapseIndia at Bhilai Institute of Technology, Durgapur, Chattisgarh on 17th February 2017. Around 1000 students (B.Tech and MCA) from Bhilai Institute of Technology and Chhatrapati Shivaji Institute of Technology, Durg participated in the drive. SynapseIndia is a Microsoft Gold certified partner with 500+ IT professionals in Noida and Delhi having offices worldwide. We have an expansion plan of opening our new office in Noida with a sitting capacity of 500 more IT professionals. 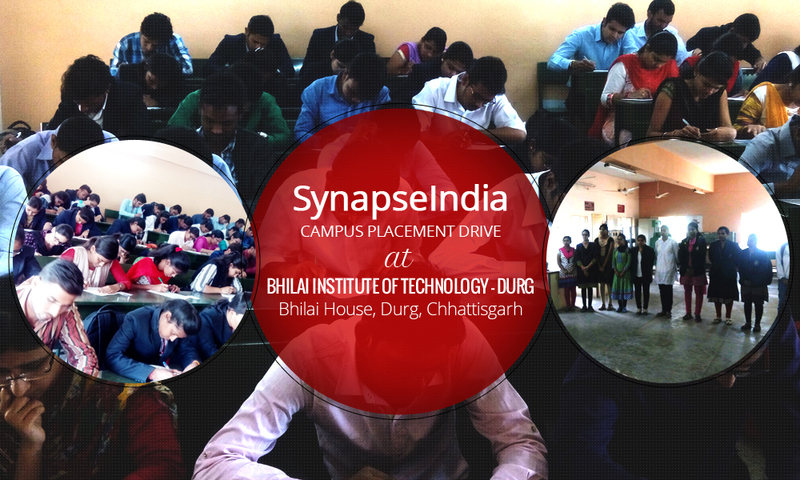 Students were so much excited to join SynapseIndia after knowing about the company that they asked multiple queries during company's presentation which were useful for all students and college staff.Placement department of college is being handled by Mr. D P Mishra. He has been leading the Training and placement cell of Bhilai for last 15 years.